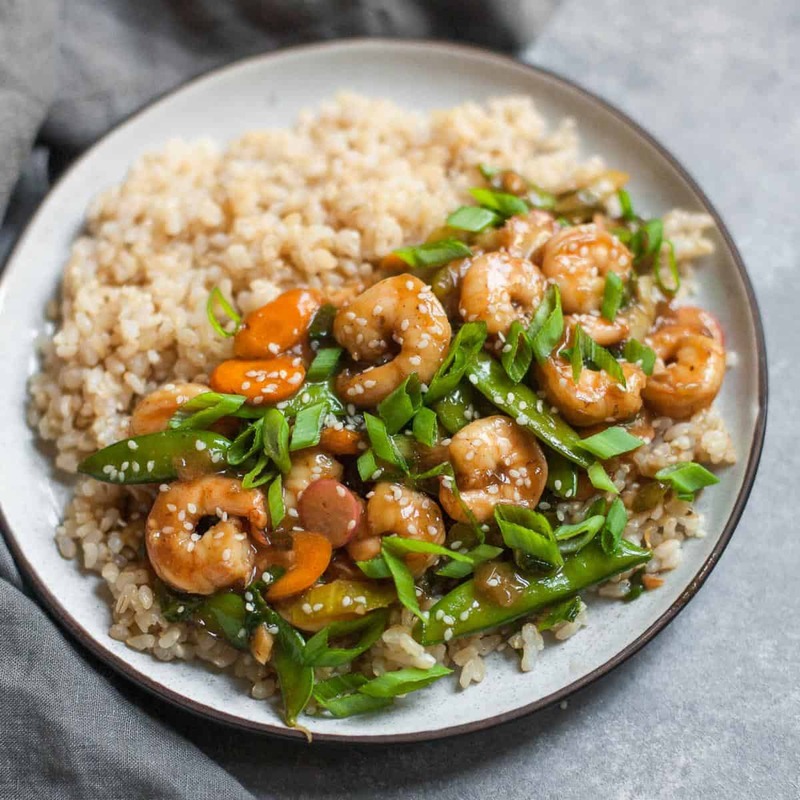 This Easy Sesame Ginger Shrimp Stir-fry Recipe is bursting flavor and very easy to make. It is healthy, filling and can be ready in about 30 minutes. A dish that your whole family will fall in love with. 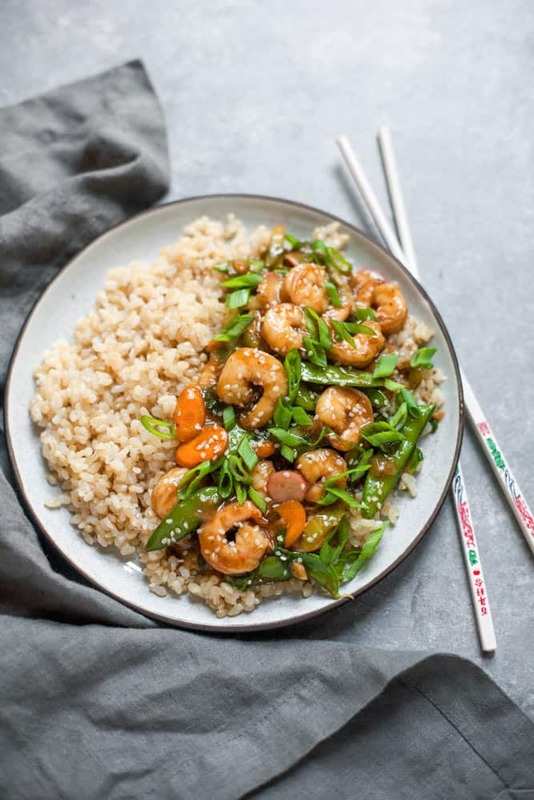 We love having Stir-fry dinners and this Easy Sesame Shrimp Stir-fry recipe was a hit! I have to admit that a couple of my kids picked out the sugar snaps because they just hate it in general. 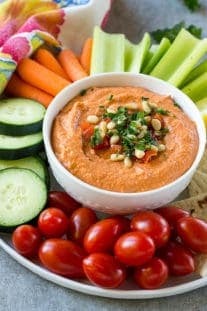 If you have picky eaters feel free to use veggies they will eat with this recipe. 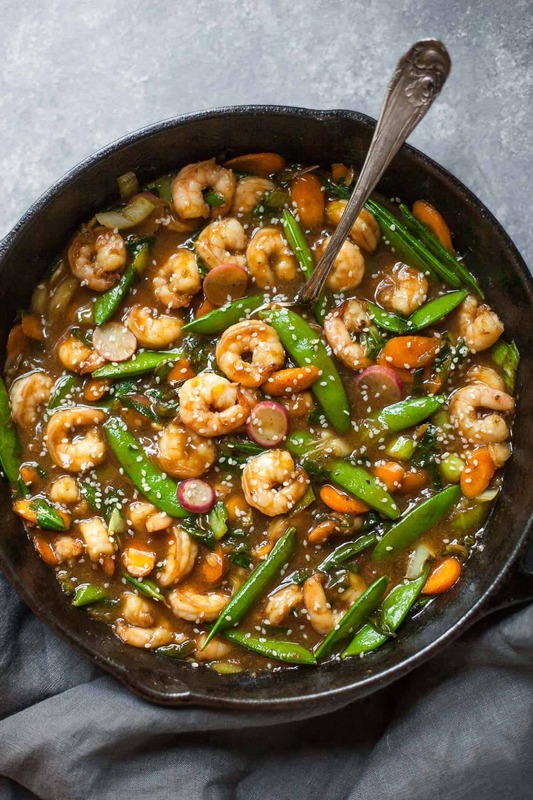 How do you stir-fry frozen shrimp? If you want to use frozen raw shrimps for this Easy Sesame Ginger stir-fry recipe you definitely can! First, remove the frozen shrimp from its packet and place in a colander. Run in under cold some cold water. Pretty much as if you are rinsing them. This will just thaw the shrimps a bit so you can break them apart and get rid of extra ice crystals. Place the Shrimps in the skillet with a bit of olive oil and cook under medium heat until pink and done. 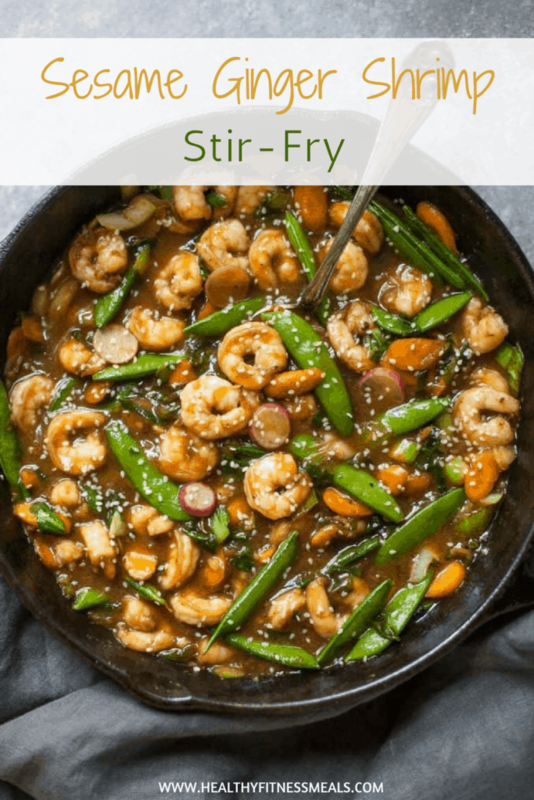 For this Shrimp Stir-fry recipe, once you’ve cooked it for a few minutes you can set aside and then add it later according to the instructions. 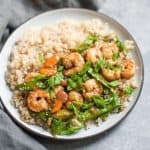 Making this Easy Sesame Ginger Shrimp Stir-fry Recipe? Please let me know your thoughts in the comments below if you liked it and don’t forget to tag me on Instagram so I can see your remake and share it! 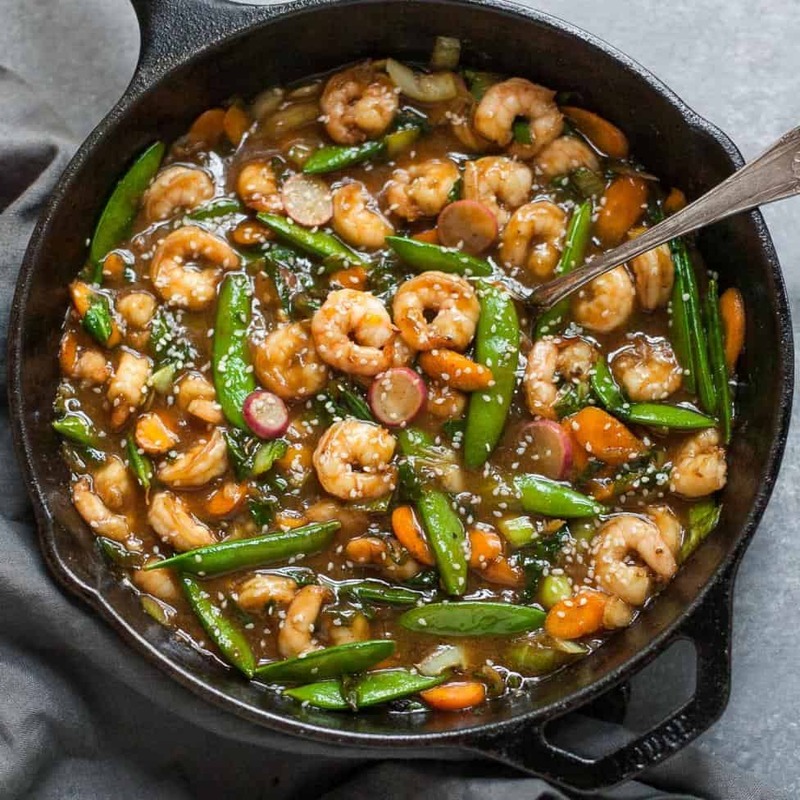 Remember to subscribe to my NEWSLETTER for free and receive all my new recipes like this easy shrimp Stir-fry recipe delivered right to your inbox! 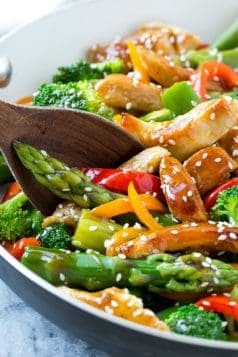 Easy to make Sesame Shrimp Stir-fry that's loaded with veggies and serviced over brown rice. 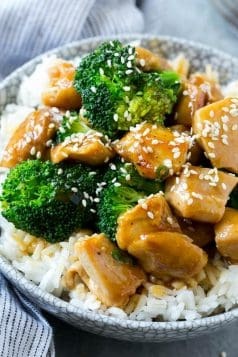 To make the sauce, whisk the honey, tamari, rice vinegar, sesame oil, and chili garlic sauce in a medium bowl and set aside. In a small bowl, stir together the tapioca starch and water to form a slurry and set aside. Heat a very large skillet or wok over medium-high heat. When the pan is hot, add one tablespoon of the oil. Once the oil is shimmering, add the white parts of the scallions and cook for 1-2 minutes, stirring frequently. Add the ginger and garlic and cook for 30 more seconds. Add the carrots, peas, and bok choy stems and stir-fry for 2-4 minutes until somewhat softened. Stir in the bok choy leaves, radishes, and about half of the green parts of the scallions, reserving the remainder for serving. Stir-fry until the bok choy leaves are just wilted. Transfer the vegetables to a plate. Add the remaining tablespoon of oil to the pan. 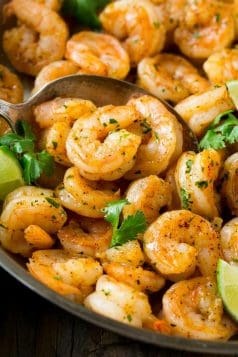 When it shimmers, add the shrimp. Cook for about 2 minutes per side, or until just cooked through. Return the vegetables to the pan, add the sauce, and stir. Add the starch and water mixture and continue to stir-fry until the sauce is thickened. Serve over rice topped with sesame seeds and the remaining scallions. Please note that the nutrition fact does not include the rice. 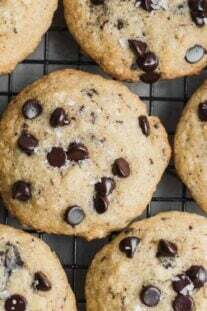 Hey Rena, this looks super good and I’d like to make it tonight but dont have tapioca starch. I’ve never cooked with it before. Do you have a suggestion for a substitute? Thank you!